Looking for the perfect comfort dish? Well look no further. 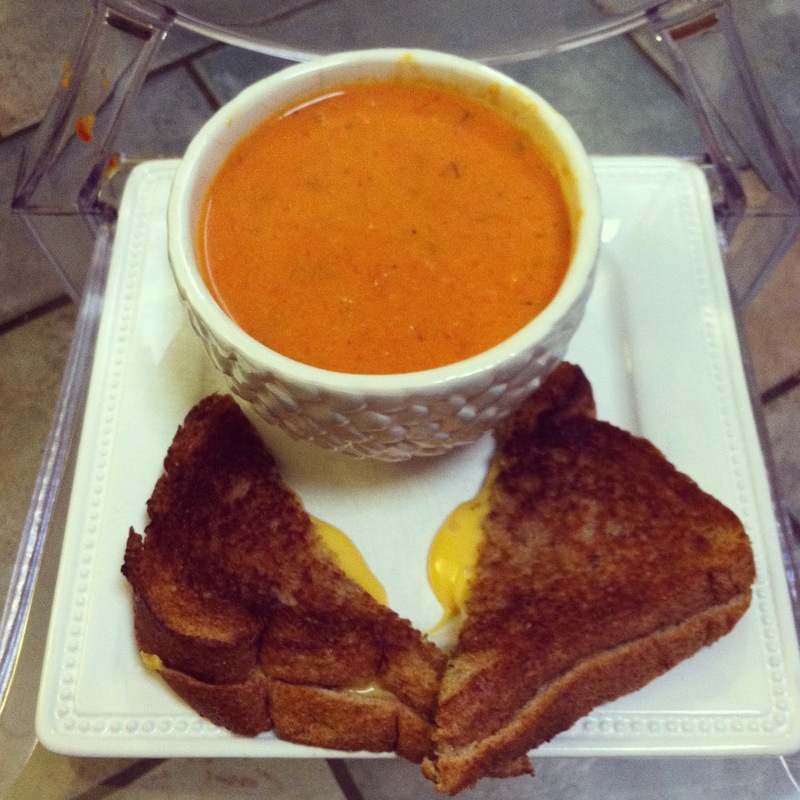 This is a fabulous spin on the standard grilled cheese and tomato soup combo. 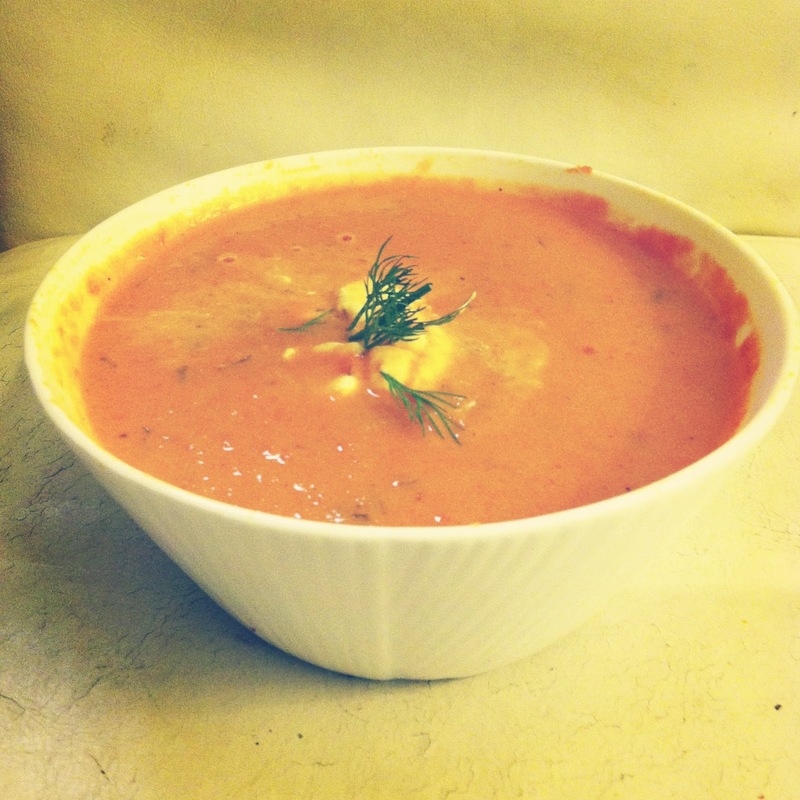 This tomato soup is knock your socks off good and so easy to make! We ate it three days in a row and I am so not a leftovers person. We even used some of the leftover soup to make sauce for our Ravioli- pure genius I tell you. You will never want to eat canned soup again. And if you have never had a truffled grilled cheese you are missing out my friends. The truffle oil is an amazing addition to any grilled cheese. Truffle Oil can be expensive, but want to know my secret? I look for it at TjMaxx and Homegoods. You can find it there in the foods section for way cheaper than the grocery store. It is usually made with white or black Truffles. Matt and I both prefer the White Truffle Oil. 1. Heat the olive oil and butter in a large saucepan over medium heat. Add the onion and cook and stir about 10 minutes. Add the carrots and celery and cook and stir another 10 minutes. 2. Stir in the chopped and crushed tomatoes, broth, salt, pepper and crushed red pepper and bring to a low boil. reduce the heat and simmer, uncovered about 30 minutes, stirring occasionally. 3. Use an immersion blender or transfer in batches into regular blender and puree. I like mine to still have some texture so don't puree until it turns to liquid. Just pulse a few times. 3. Remove the soup from the heat and stir in the dill, parsley and cream. Taste for seasoning and season with additional salt and pepper if desired. Serve warm or store refrigerated until ready to serve. We have tested this sandwich several times but this combo seems to work best. Matt and I both swear by good old American Cheese on grilled cheese sandwiches, but if you don't like it I am sure any cheese would work. I always use wheat bread because that is all I buy but I am sure it would be off the hook with white bread. Take the two slices of cheese and place between bread. Spread a thin layer of mayo on the outsides of the bread. The mayo is what helps the bread brown nicely. You can also spread on inside if you love mayo. You can use butter if you don't like mayo but mayo works so much better and gets the bread slightly crispy. After assembled place mayo side down in a pan drizzled with truffle oil. Also drizzle truffle oil over top side of bread as well. Use a decent amount of oil so you can taste it but not too much as to make bread soggy. I would guess I used about a teaspoon per side. Cook until cheese is melted and bread browned. I just use a regular old skillet pan to cook ours in on medium heat. Do not use high heat or it will burn. Cook it slow and on medium heat. Slice and dig in! This grilled cheese will change your life. Why oh why do you toy with my heart?!?! This girl is never going to drop weight with you posting such recipes. Damn! This looks to die for! There is no tomato soup and grilled cheese combo that doesn't warm my heart! It's been raining here all week and I'm flying solo so this will be our dinner tonight for sure! I want this meal so bad, particularly the sandwich. This looks so amazing- I will be looking for truffle oil today! yumm, this would be a perfect dinner for tonight. It is cold and dreary here today!! Yum! And as blue collar as it may be, American cheese makes the best grilled cheese! Tooo good. Can't wait to try this! Hot damn, that recipe looks good! I love a good tomato soup and grilled cheese combo. Yumm!!! I cannot wait to try both of these- I know my husband will thank me! I saw your instagram the other night and I have been WAITING for you to share this recipe...I love a good grill cheese and truffle oil is the BOMB!!! I can't wait to try that soup-I don't really like tomatoes but with all those other ingredients it sounds perfect! I like that toast, it looks really delish! I also like your book, Jesus Calling! loved seeing this! you eat so good! YUMM!! Both of these are right up my alley, can't wait to try them. Thank you so much for sharing this recipe. Just made it for dinner tonight and it was amazing! I had to substitute the red pepper flakes for chilli flakes - I live in Australia and it seems red pepper is not popular over here.